A spiky, wormlike creature with 30 legs -- 18 clawed rear legs and 12 featherlike front legs that likely helped it filter food from the water -- once lived in the ancient oceans of the early Cambrian period, about 518 million years ago, a new study finds. The critter is one of the first known animals on Earth to develop protective armor and to sport specialized limbs that likely helped it catch food, the researchers said. This newfound species lived during the Cambrian explosion, a time of rapid evolutionary development, they said. The creature likely used its rear clawed legs to anchor to sponges or other penetrable surfaces, and waved its feathery front limbs to and fro in the current to catch nutrients in the water, Ortega-Hernández said. This technique is still used by modern animals, such as bamboo shrimp, that capture passing meals with their fanlike forearms. But, because the Cambrian critters were "soft and squishy," it's likely they waved their limbs in a gentle motion, Ortega-Hernández told Live Science. "I don't imagine they would have quick muscle control." A squishy creature that didn't move quickly needed a steadfast defense strategy, and that's likely why it had so many spikes, he said. 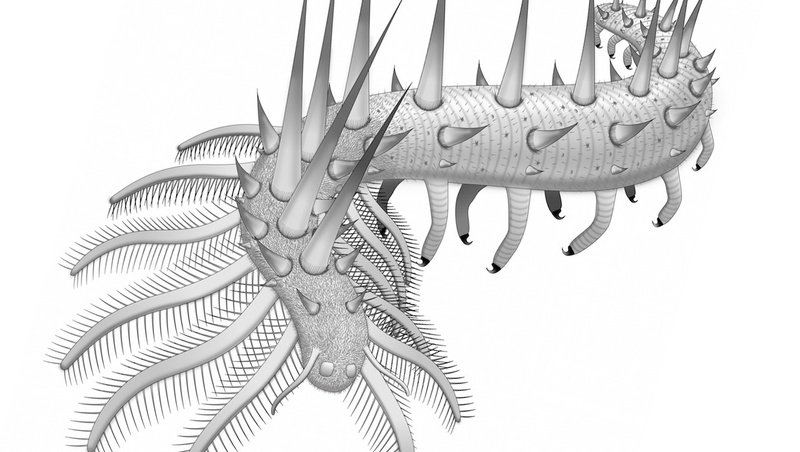 Other Cambrian wormlike creatures, such as the bizarre Hallucigenia, also sported spines. "Hallucigenia has two sets of spines per leg," Ortega-Hernández said. "This one has up to five, which means it was a much more heavily armored creature." Researchers have dubbed the new creature Collinsium ciliosum, or Hairy Collins' Monster, named after Desmond Collins, a paleontologist who discovered a fossil of a similar Cambrian wormlike creature in Canada in the 1980s. Since then, researchers have found five species of Collins' Monster (in the family Luolishania), including one from Australia. But, unlike earlier fossils, the newfound specimens offer researchers a spectacular view of the prehistoric creature. One fossil displays much of Collinsium ciliosum's body, including its digestive tract and even the delicate, featherlike structures on its front limbs. Based on the fossils, when it was alive, the worm likely didn't have any eyes or teeth, Ortega-Hernández said. Over the past three years, scientists at Yunnan University in China and the University of Cambridge have uncovered and studied 29 C. ciliosum fossils from the early Cambrian Xiaoshiba biota, adeposit in southern China that contains a rich collection of fossilized Cambrian creatures, he said. An analysis of C. ciliosum's anatomy indicates it's a distant ancestor of modern-day velvet worms, also known as onychophorans -- a small group (just 180 species) of squishy worms that live in tropical forests, shoot slime at their prey and resemble legged worms. Interestingly, the Collins' Monsters were likely a more diverse group that "came in a surprising variety of bizarre shapes and sizes" than today's onychophorans, Ortega-Hernández said in a statement. The study is "a superb description based on absolutely exquisite fossils," said Greg Edgecombe, a researcher of arthropod evolution at the Natural History Museum in London, who was not involved in the new study. The new finding drives home that Cambrian wormlike animals such as Hallucigenia and the new Collinsium are the ancestors of Onychophora, Edgecombe said. "That means they are more closely related to Onychophora than to any other living groups (such as arthropods or tardigrades)," Edgecombe told Live Science in an email. "Rather than floating around on the tree of life without an exact home," these creatures can be pinpointed to a living group, Edgecombe said. The findings were published online Monday in the journal Proceedings of the National Academy of Sciences.